I’ve been following the celiac listserv since I went gluten free. My doctor directed me to it as a helpful resource. The information shared was a bit overwhelming at the time (what isn’t when you first go gluten free, right? ), but I found myself especially gravitating towards the personal stories. 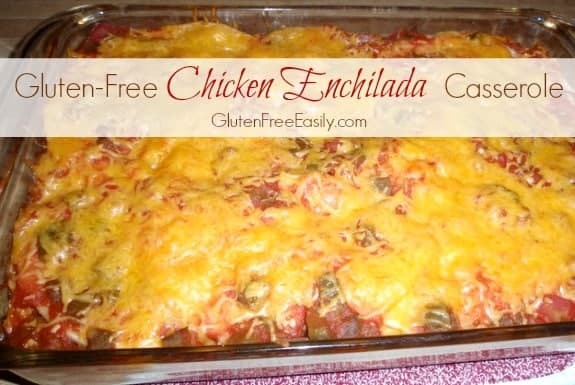 I also found some product recommendations and the recipes—always the gfe ones—like this gluten-free Chicken Enchilada Casserole, helpful. But, first, let me tell you a little bit more about Valerie and some information that she shared that has stayed with me and is getting more press these days. I don’t remember if Valerie had been diagnosed as celiac or non-celiac gluten sensitive, but she reacted to even the tiniest amount of gluten (something many of us can relate to). She was a grandmother and she found that after every visit by her toddler grandchildren, she would get ill. Somehow she had been “glutened” just by the shared hugs and kisses with her sweet grandchildren. Valerie came to the conclusion that this occurrence was not surprising really as she would love on her grandchildren practically nonstop—as all good grandmas do. But her grandchildren always had crumbs on their bodies or clothes as all little ones do from eating tiny bits and pieces with their fingers or being messy with utensils. So she started bathing her grandchildren as soon as they arrived at her house, and, of course, immediately thereafter dressing them in clean clothes. Her approach worked! She never got glutened again in this manner and she was able to fully enjoy all of the visits from her grandchildren. Valerie was also quick to respond when members queried about the psychological effects of gluten. Her son had suffered from a psychiatric disorder for years and she reported that currently he only demonstrated symptoms when he accidentally ingested gluten. Even the tiniest amount would cause him to behave very bizarrely. It got so that his family and friends would immediately know if he’d eaten some gluten. Dr. Stefano Guandalini, the Medical Director of the University of Chicago Celiac Disease Center at the time of this post, responded to questions on the topic of neurological and psychological celiac symptoms in this article in Gluten Free & More (formerly Living Without). He shared the story of his 8-year old celiac patient who had been admitted to the hospital with hallucinations and profound depression. Blood testing showed that her gluten anitibodies were extremely elevated. Further investigation showed that because the child had stopped experiencing digestive symptoms, her parents had been giving her cookies on the weekends. Re-education of the parents led to a truly gluten-free diet for the young girl and her symptoms disappeared. I also heard Dr. Guandalini speak on another celiac individual’s non-digestive symptoms, specifically, anxiety. Neurological issues related to gluten remain some of the most difficult cases to diagnose, largely because of lack of knowledge in the medical community. I doubt very seriously if many doctors, maybe that should be any doctors—other than the fictional Dr. Gregory House on the television medical drama, House—would consider celiac as a possible cause for hallucinations, profound depression, and severe anxiety. I know many patients who have sought help for such conditions and have never been tested for celiac. In fact, celiac disease never even entered the picture. Dr. Guandalini stated in the article I linked to above that patients can have idiopathic epilepsy (meaning epilepsy with no known cause), ataxia, peripheral neuropathy, recurrent headaches, and “autistic-like” behavior (e.g., sadness, failure to socialize, excessive irritability, anxiety) with no accompanying gastrointestinal symptoms. In these cases, the gold standard for a celiac diagnosis simply cannot be applied. Dr. Guandalini states that a positive result on the anti-tissue transglutaminase (tTG) screening test alone is a diagnosis of celiac in such cases, because these patients will have few or no digestive symptoms, and they will show no damage to the small intestine. I truly wonder how often a celiac diagnosis actually gets made under such circumstances. I think a diagnosis with such symptoms (and such lack of typical symptoms) would occur far, far less than a celiac diagnosis for someone who has digestive symptoms—and we know how under diagnosed even those cases are. So, please spread the word on the neurological and psychological ramifications of celiac disease, so that individuals, their family members, and physicians will look at this other facet of celiac disease. Note that the symptoms shared here are not all-inclusive; these are simply the particular ones cited by Dr. Guandilini in the article to which I linked and several years later when I heard him speak at a conference. In the article, Dr. Guandalini was also asked about gluten sensitivity. Dr. Guandalini responded that although he used to be skeptical about gluten sensitivity, today he is “respectful” of those who have tested negative for celiac disease, but report true benefits from a gluten-free diet. He added that in the lab at his own center, early data is showing that changes do occur in the small intestine of gluten-sensitive patients. That is a huge finding in my opinion, and I look forward to additional research results being shared. Valerie, the celiac listserv member who I mentioned earlier, was always so generous with her time and information. She and I even exchanged emails a few times. Valerie hasn’t posted in a few years now. I find myself wondering what is going on with her and hoping she is well. 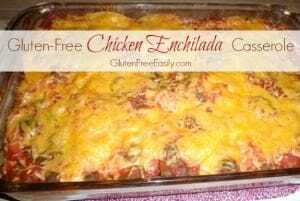 I miss Valerie and I’m grateful for the recipes she shared, including this gluten-free Chicken Enchilada Casserole, which I’ve modified a bit. Here are step-by-step photos so you can see how easy this recipe it to make and how delicious the resulting casserole is! Preheat oven to 350 degrees F. Coat a large, deep skillet with little bit of oil; heat over medium heat. Add onion, garlic, chili powder, salt and pepper; cook, stirring often, until softened, about 3 minutes. Add one cup of tomatoes, tomato sauce, and cilantro (if used). Cook 5 minutes. 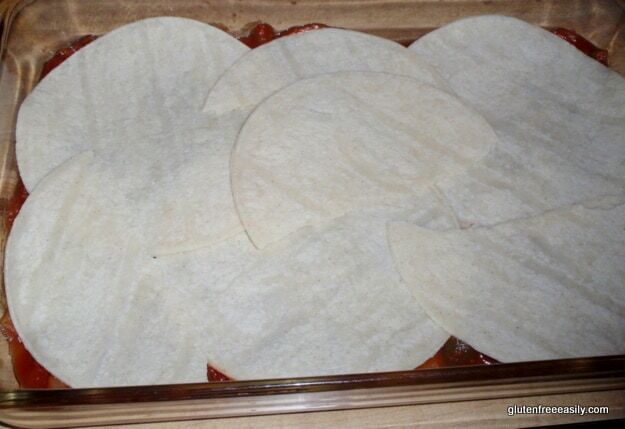 Spread one half of the jar of salsa in an ungreased 9" x 13” baking dish; top with 5 tortillas (break into pieces as needed to mostly cover salsa). 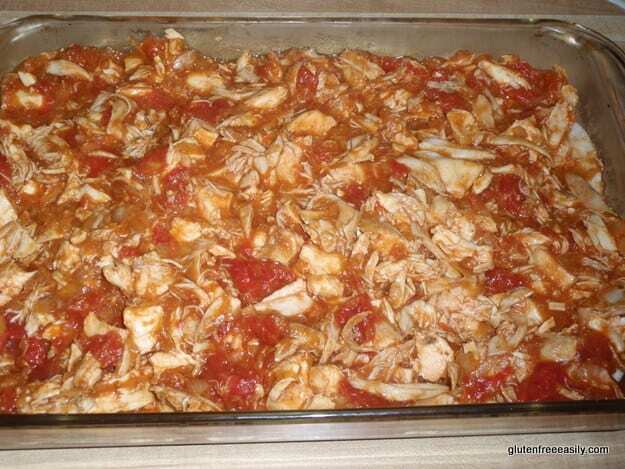 Top with chicken mixture; sprinkle with half of the cheese. Top with remaining tortillas. Spread with remaining salsa; sprinkle with remaining cheese. 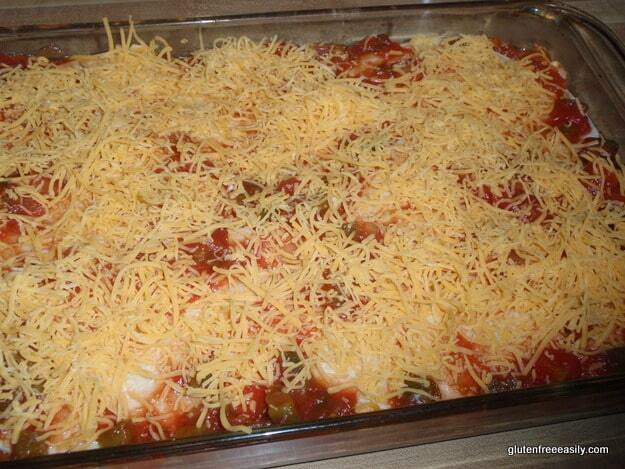 Bake until cheese is melted and the casserole is hot, about 15 to 20 minutes. I usually use three boneless chicken breasts that I have cooked in my slow cooker in one cup of chicken broth made from bouillon. Slow-cooked chicken breasts shred easily. Leftover chicken or turkey (great way to use leftovers from my special turkey breast or any Thanksgiving turkey), gluten-free rotisserie chicken, etc., may also be used. Some readers have also substituted cooked ground beef. You can spice it up by using diced tomatoes with green chiles, adding more chili powder, adding chipotle powder, and so forth. Some friends like making this dish using ground beef. Personally, I really prefer this dish with chicken or turkey, but feel free to experiment. Eight ounces is not a huge amount of cheese for a casserole this size, but cheddar cheese often appears to be present in a greater amount than there actually is because of its rich color. That can be a good thing for the cheese fanatics. I often use more cheese for topping (than I do when sprinkling over the chicken mixture), just so I get that visual appeal. Originally published February 3, 2010; updated November 24, 2018. Love your site! We are in the first stages of learning about Celiac. Our daughter is suspect for this. Thanks for all of your info! Hi Stacey–Welcome to gfe! Thanks so much for the compliment! I truly appreciate it. 🙂 It’s truly rewarding to know when folks find gfe helpful. There are some great reference sheets on the sidebar under gfe’s tip sheets that you may find helpful for making the transition to the gfe approach. In my opinion, it’s so much easier and makes more sense than the traditional transition to gluten-free eating. Please don’t hesitate to shoot me an email with any questions! Great looking casserole and post! I’m one of those people who doesn’t have physical symptoms when I eat gluten. I suffered from depression for years (and went to my doctor for it, but she didn’t know what to do) before figuring out that gluten was the problem. It can be a hard thing for people to understand, I think, when I don’t have an official Celiac diagnosis and they can’t “see” something wrong. Sometimes I feel like I have to defend against the idea that it’s all in my head. I’m sure you all know that it’s not though. That’s one reason I love this community. You all know and understand what’s going on. Hi Iris–Thanks very much! 🙂 Yes, often the official celiac diagnosis is the only thing that is recognized sadly. There was a point that I wished for that celiac label myself … not unlike folks looking for the gluten-free label on food I might add. There would be no need for an explanation, justification, etc. I’ll tell you that the need to explain/justify one’s gluten-free diet without a celiac diagnosis diminishes over time. We are all the best (and sometimes the only) advocates for our own health. But, you are right. Being involved in a community of folks who get it certainly makes life much easier. 🙂 The support group I lead has individuals both diagnosed with celiac and others who would possibly never get a celiac diagnosis, but yet who react very adversely to gluten—with a medical history to prove it. The main thing is that folks are learning about their own bodies and healing!!! Isn’t that what we ultimately want? Healthy people. One day we’ll have a more comprehensive definition of what is considered a bona fide gluten issue, but we are not there yet. I can see it though. Sounds delicous! I can’t wait to try it. I would only change two things. I’m allergic to tomatoes and usually substitute pinapple for tomatoes. I know it sounds weird but they have a similar texture and it gives it a fruity flavor. I also use green salsa instead of red. What’s the address of the list serve. It sounds like a great source of info. Thanks Shirley! Hey there, Carol!–Wow, I didn’t realize you had a tomato allergy. Sounds challenging, but just like with being gluten free, it looks like you’ve figured out what works for you as far as alternatives. You can sign up for the celiac listserv at this site. Thanks for asking! I meant to include that link in my post, so I’ll do that now. I recommend that you sign up for the digest version of the listserv emails; otherwise, your In Box will fill up very quickly. With the digest version, you can skim the emails that are sent out to see if any are of interest, instead of getting many that may not apply to you (e.g., an email requesting info on traveling to country x, which you don’t plan on visiting). Hope you find it helpful! Let me know if you have any more questions. mmmm…that looks good. Thank you so much for sharing. That story was wonderfully told! Hi Fire-Eyes–Welcome to gfe! Another gluten-free blog—how cool. 🙂 I love how you use old photos and ads in your posts. You get a little trick back in time with your recipe and info. 😉 Thank you for the nice words! Thanks for this great recipe. (Hubby just bought a nice big package of Mission Corn Tortillas for 95 cents with a 75 cent coupon. Score!) Thanks also for this discussion on the neurological effects of celiac disease. Jenny McCarthy has taken a lot of criticism for her views of how a gluten free diet has helped her autistic son. I don’t know about anyone else, but I admire her determination to help her son and to share that information with others. Thanks again for such a thoughtful post! Hi Kay–Great to see you! Oh, I love those big packages of corn tortillas, and that IS a great deal. 🙂 I can get a lot of meals/items out of one package—this casserole, chicken tortilla soup, fried tortilla strips in place of crackers, grilled cheese, quesadillas, and more. I agree with you regarding Jenny McCarthy. She is talking about what has worked miracles with her son. And, many others have had the same success in placing their children with autism on a gluten-free, casein-free diet. Some of them are my fellow gluten-free bloggers/friends. Those of us who see transformations when people go gluten free are determined to share the good news in any way we can. Jenny McCarthy has been a powerful advocate. I think I’ll give this a try tonight. I have some leftover shredded chicken to use. It sounds so easy just layering the ingredients rather than rolling enchiladas. Thanks! Hi Linda–I’ll be waiting anxiously to see what you thought. I’m sure you’ll decide if you need to tweak this recipe any for your family. Sometimes I add a little more cheese. While I often use cheddar cheese because I alway have that on hand, I also really like the Mexican and Monterey Jack blends in this casserole. And, I love using the special turkey breast leftovers because of the zesty flavor that turkey has. Great post about different symptoms of Celiac! You mentioned Dr. House, did you happen to see the episode where the diagnosis was Celiac? I jumped up and cheered! The character had some pretty extreme symptoms. Also, we just moved into our new house and I met the neighbor across the street from me last night and she eats gluten-free! Yay! I have a feeling her and I will be sharing GF goodies in the future! Hi Lisa–First, thanks so much! 🙂 Yes, I did see the episode on House where the mother was ultimately diagnosed with celiac. In fact, my whole group was watching that one! We were both pleased and a bit annoyed at the show actually. That case was so extreme, we didn’t think it really helped make people aware of more common symptoms. We do always appreciate any mention of celiac though. Anything to get people to say hey, what’s that? Then, they might recognize their own symptoms, if applicable, when they read the symptoms. This looks super delicious Shirley! I will have to try this one too!! All of the recipes this week over at “What can you eat that is gluten free?” are sooo good!!!! My husband would love this! Yadi–Hi! Happy Wednesday. 🙂 Hope both your husband and you enjoy this if you make it! I need to head over to Linda’s and check out all the submissions. The titles sure sound great! Wonderful casserole! I would love this for lunch…like, right now. I love that listserv. I had the benefit (if you call it that) of growing up with my dad and his struggle to find out what was wrong with him for several years, only to discover it was celiac disease. (He subsequently was tested by his doctor, who never thought about that diagnosis, and sure enough – that’s what it was.) So I was aware of the disease. When I started really dealing with IBS symptoms, I found that listserv, and was given the blood test. Of course, I was negative. Now, 7 years or so later, I finally know that the gluten really was the issue – but only because I read through posts on that listserv (and posted a few myself) that allowed me to understand that my extreme brain fog, fatigue, numbness and tingling in extremeties, in addition to the digestive issues, were caused by gluten – and that gluten intolerance doesn’t always show by leaving you super-thin and emaciated-looking. While I’ve never been officially diagnosed, I know I’m really sensitive to gluten even after being off of it for a mere 8 months. I’m not 100% healed, but I’m tons better than I ever was. Unfortunately, this was not because doctors thought to consider celiac as a possible cause. It was only because of my own research. So yes – we need to get the word out about ALL of the symptoms of celiac disease! We also have corn sensitivities in the house, so I am thinking that thin slices of zucchini might step in for the tortillas. This looks great! I find the smaller eggplants are fine with out the addition of salt. The larger ones, in my opinion, need a bit. They can also be a bit tough if not cook really well. Also, you can soak the larger ones in a blend of baking soda and water. Just slice them up and let them soak for at least a half hour. If you are just trying to get used to them you may want to dredge them through a bit of corn starch and fry them in a skillet until lightly browned before you add your other ingredients. Now I am going to have to buy some eggplant…man, that sounds good. Thanks, and I love your signature phrase! Hi, denise–Welcome to gfe! Using zucchini is a great idea. 🙂 That possibility reminds me of this Cheesy Chicken Zucchini Bake that I made a while back. Another option would be to use the brown rice tortillas that are gluten free. Let us know how your version works out! Thank you for your kind words, Shirley…what an encourager you are! It turned out great, just disappeared too quickly. We had one little zuke, and thinly sliced, it worked great. I will do this again next week, with more veg next time. My husband is a vegetarian (and doesn’t do cheese for the fat/casein), so the kids will enjoy for lunches. Hi Denise–Happy to be helpful. 😉 Thanks so much for returning to let us know! I’m so glad your version was successful. 🙂 I bet you’ll eventually come up with a vegetarian version as well … one that will make your whole family happy. In that recipe I mentioned earlier (the Cheesy Chicken Zucchini Bake), almond flour and olive oil can be used alone—with no cheese—to give a nice Parmesan-cheese type effect. 😉 Those leftovers will make great lunches. The enchilada recipe looks great. Thanks for all the other celiac info. I know it is helpful to many people. Thanks for linking your post to TMTT. Hi Lisa–You’re welcome. Thanks so much for stopping by and your kind comments! I do hope this post helps some folks. Thank you for the information on the non-standard symptoms of Celiac. For the past year and a half, I thought I was entering perimenopause (I just turned 40) because of the bloating,irritability, mood swings. I thought that I was going crazy! I made some adjustments to my already fairly healthy diet…I avoid wheat and I feel better. I’m not snapping at my husband or kids. And I thought that I was lactose intolerant most of my life, but lately, I noticed that I am tolerating dairy but if I eat some wheat, then I get tummy trouble. Thank you, Shirley. You are a wealth of information! I will definitely see my doctor and check for celiac and go from there. I now have more energy to get a complete grip on the wheat/gluten situation in my life. Great post Shirley. I am always telling people about how celiac disease shows so many different symptoms (and then there’s silent celiac). You are right, most people think digestive issues. Some poeple, however, don’t even have digestive issues – rather something else entirely like joint pain. I haven’t shared this much, but I was having some psychological symptoms before I was diagnosed – before the digestive symptoms started. Everyone thought it was post-partum depression but it just didn’t fit. I had panic attacks and anxiety 24/7 – could hardly sleep. After I was diagnosed and went gluten-free, those symptoms went away. During the time I was having the symptoms, I thought I’d never be the same. I didn’t feel like myself and I couldn’t see the “light” essentially. So yes, more people need to be aware of all the symptoms that someone with celiac can exhibit. Thanks, Heather! I totally agree with you. I just can’t get everything into each post on this topic. It’s estimated that about 40% of those with celiac have no symptoms. I, and some doctors, suspect that number is actually lower. Folks say they don’t have symptoms because they may not associate certain conditions with celiac; e.g., sleeplessness, non-DH skin issues. But, thanks for bringing silent celiac up. Celiac can be silent similar to heart disease … with heart disease, one might have a heart attack. With celiac, one might suddenly have intestinal lymphoma. Thanks also for mentioning the other symptoms, like joint pain (that was a big one for me … I had come to avoid stairs due to knee pain). This post is a listing of neurological and psychological issues only and it’s far from all-inclusive. These are just symptoms that Dr. Guandalini cited in his article. I might have to update my post to make that clear—thanks for pointing it out. I sincerely thank you for candidly sharing your own psychological symptoms before diagnosis. They might be very helpful to others. I experienced anxiety myself shortly before diagnosis (and sometimes still experience it if I accidentally get glutened). It’s my understanding that many of the psychological and neurological symptoms are related to malabsorption. I also had a horrid time with post-partum type symptoms and digestive issues at the same time. You can almost guess what I was eating as a result (which also was the cause … I just didn’t know it). I was living on crackers, toast, cereal, canned soup … all the stuff that would just exacerbate the situation. It was a very, very tough time for me. I continued with many other symptoms for years and years later I had come to the same place as you—not feeling like myself and wondering if I could truly recover. That’s why I refer to the doctor who diagnosed me as gluten intolerant as my “miracle doc.” I don’t want to think about what might have happened if I’d continued eating gluten. Thanks again, Heather. I’m sure your story will help many gfe readers. This looks great, Shirley! 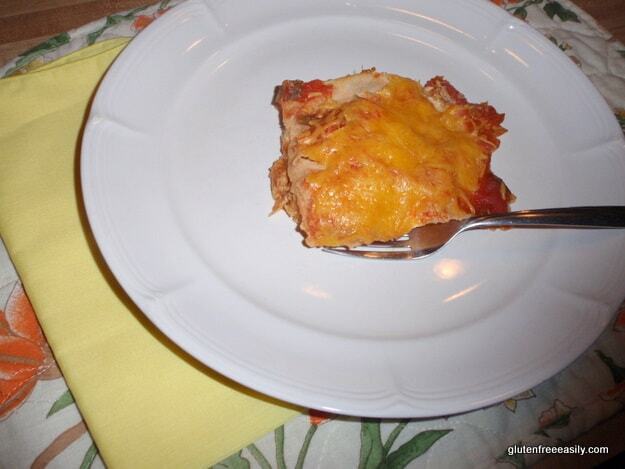 I love chicken enchiladas! Thank you for this information! Wow–this sounds like a tricky sensitivity and disease to diagnose, with such varied symptoms. Heading over to your sidebar. I can really relate to the grandmother you spoke of who got glutenated every time her grand kids came over. I have a 3 & a 5 year old and feel that no matter how hard I try they are constantly covered in glutenous crumbs. I was diagnosed with celiacs 2 months ago and am finding the cross contamination from my children to be my biggest obstacle. Thanks for sharing your story … hope to see you more here at gfe! Yep, I think I’m one of those G-intolerant crazies! What interesting findings. I am bad for going gf back to wheat (just to “see”) and back to GF. I always inflate after eating gluten, and get moody. You would think I have learned my lesson! I guess being intolerant always has me guessing. Is it all or nothing? Or is once a week o.k.? The funny part is I’m finding the longer I go gluten free the more I don’t want bread. The more I am turned off by wheat baked goods, because deep down I know they make me feel like crap! Hi Chelsey–It’s definitely all or nothing with gluten to achieve your best health and prevent further illnesses (e.g., other autoimmune conditions). Many folks who see that they do better without gluten don’t go 100% gluten free without the validation of a gluten issue through testing. Getting tested for celiac should be done first. If that is negative, consider gluten sensitivity testing and celiac gene testing. Some folks just decide they don’t want to pay for or undergo more testing and just go 100% gluten free on their own. I totally recommend testing, but you have to make the decision on what works best for you. But again, you don’t want to eat any gluten. If you are going to get tested though, you want to do that before going gluten free. Otherwise, your test results will not be accurate. Thanks for taking the time to comment! Please email me if you have more questions. Shirl — can I use one of your photos for a product post I’m doing next week? I did an almost IDENTICAL version of this with Gluten Free Sandwich Petals! But I made a small test portion (just for me) and revised this same recipe a little bit. Lemme know. YUM I love your recipes, btw! They used to say the same about me being bizarre whenever I had corn syrup, I guess it is just an allergy or something. I am unsure, what exactly is gluton? Hi Sean–Welcome to gfe! I’ve heard about folks having reactions to corn syrup, all fructose, etc. Allergy or intolerance, it would seem. You’re very smart to stay away from corn syrup if you have that reaction. Gluten is a protein found in wheat, rye, barley, and regular oats (because they are contaminated in the fields and processing areas with wheat, rye, and/or barley). Hope that helps. Thanks for commenting! This looks great! I love enchiladas. This looks like a much easier way to achieve all those great flavors. Thanks for sharing this one. lthough I can’t eat this, it looks fantastic and I am sure, delicious, for those who can eat it. It is another great winter meal. I would have never thought about how crumbs on a kid touching someone with celiac could impact them. Wow! Really something to think about. Hi Anali–I know it seems extreme, but those little crumbs get on one’s hands or on one’s face/mouth when kissing on a little one. Our bodies really can’t tolerate even those tiny crumbs. That’s why the best route is to have a gluten-free kitchen (or mostly a gluten-free kitchen )to preven that type of cross contamination. looks like something I would make! a variation on the Mexican Chicken I make and a tortilla casserole. Think I can put them together right here! All the taste we love at our house. love your blog as usual!! Hi Wendy–Oh, you’re so sweet—thank you! Sounds like you’ve come up with a great new recipe with all your favorite flavors! 😉 Enjoy! I know I have already commented on this one but, wow Shirley! This looks amazing. I’m not much of a casserole person, but this I will gladly eat, especially because it is darn simple t make too (Yay!). I am happy you talked about all the different symptoms of celiac/gluten intolerance. It has got me back on the GF bandwagon (woot, woot!). I’ve been completely GF for a week and a half and I can noticeably feel less pain in my hip (When its bad it goes from my toes all the way up to my head on my right side, plus a migraine). When I was off the wagon my head aches were returning and my hip pain getting really bad. Sounds very similar to your story, does it not? So, even though I am not a celiac (I’ve only been tested by my GP), I do think the headaches/pain is related to gluten. I think my reaction builds upon itself the longer I am in contact with it. I love reading your comments! You are full of wise advice and tender words…And thanks for linking up to Simply hot recipes. Hey Chelsey–Your comment touched my heart. First, I’m so glad that you are seeing the positive effects of being completely gluten free during that time. Yep, only takes a teeny tiny amount of gluten to continue damage/symptoms, so it’s hard to see improvement if you are consuming any gluten But, once you completely eliminate it, you will start to see the positive bennies as you have. Love that! Headaches are often related to gluten and pain more often than folks realize. Yes, your reaction will continue to get worse as you eat more and more gluten. There can be so many symptoms related to non-celiac gluten issues. One really helpful resource is the personal stories on the National Foundation for Celiac Awareness site. Alllison’s story is one that speaks to the pain issue. Thanks so much for all your kind words, dear. 🙂 It’s truly means a lot to know my comments and posts are helpful. I came across this post while looking for a GF chicken enchilada recipe. Thank you so much for addressing the topic of neurological manifestations of gluten. I am the mother of 3 daughters. After my diagnosis, my 12 yr old’s extreme gas and bloating were enough to motivate her–even at a young age–to go gluten free and discover that she felt much better. My two older daughters are a different story. My 23 yr old had a severe autoimmune attack on her nervous system that disabled her physically and emotionally for 4 years, causing her to miss out on going to college. She continues to suffer with a chronic unexplained cough. My 20 yr old has bipolar, severe anxiety, ocd and multiple skin lesions (granulomas) plus recurring nausea and migraines. She has also told me that she loses clumps of her hair and her toenails occasionally fall off. She has not been able to have sustained success attending college. I have had many conversations with both these beloved daughters about gluten and tried to get them to see doctors that might help them discover whether it is at the root of their multiple and disabling symptoms but they are both mightily resistant to the idea of giving up pasta, bread and beer. My oldest did recently, on the recommendation of her new doctor, try a 6 week trial of gf eating. She says it didn’t make a difference in her cough. I do appreciate that she tried but I continue to wonder and wish there were better testing for her to have more data than a 6 week trial –maybe not 100%GF–she had no support for how to eat GF–doesn’t live near me and didn’t want to tell me about doing the trial. It is a loaded emotional topic for all of us, even though we have a great relationships. It is heartbreaking to watch my daughters suffer. I think more should be written about those of us who have come to understand our intolerance to gluten (I have non-celiac gluten intolerance) and what it does to us psychologically to witness our family and friends cope with unremitting symptoms but refuse to explore gluten as a possible culprit. Sometimes I feel like I see everything through a gluten-lens, and that I’m just obsessed. But then more studies come out to confirm my suspicions. I am so impatient for the day when the medical establishment understands the huge number of their patients whose “idiopathic” conditions are actually related to gluten. Thanks for the work you do on your site. Today it is adding a little sanity to my life! Hi again, Momat32–So sorry for just now getting back to you. I couldn’t agree more on being “obsessed” and seeing everything through a gluten lens after one is diagnosed. Once you see “it” and get the big picture, you see it everywhere and realize how it’s affecting family members and even friends. You want to help them find the good health that you’ve found by going gluten free. So I understand your impatience and frustrations with the world and those closer to you. I went through that initially. For example, my son had gluten issues most of his life although I didn’t recognize them as such at the time. It wasn’t until I was diagnosed as gluten sensitive (later I was gene tested, which was positive) that my son was tested and determined to be sensitive as well. Then he started having DH (which was biopsied incorrectly; didn’t know that at the time) as a teenager and would go gf briefly to get rid of it, but would return to eating gluten. He decided to stop eating gluten at age 20, 2 years ago. He made this decision on his own after numerous health issues and testing, even celiac testing, although I had to tell the doctor what to order and the proper tests weren’t ordered the first time. A second round of testing was conducted and the results were still negative. But testing itself has major holes and I wonder about the validity of his testing given the situation. All that said, the very best advice I can give you is to show your family members how to live gfe and not to constantly talk about what gluten is doing to them. I had to do this with my son and it eventually worked. Show them by example how one can make great meals from real food that is naturally gluten free, show them how mainstream snacks can be gluten free (this is a biggie for teenagers and those in their 20s), show them how certain meals you can order out would be gluten free, show them well-known restaurants that have gf menus, etc. I hope you will check out my gfe tip sheets on the sidebar. They can be invaluable for this type of info. I know this advice sounds impossible, but the more you do it, the easier it becomes. Yes, you will still have your moments and days when you want to rant and rave in frustration, but those will be fewer and I believe/hope that slowly change can take place in your family. It can be very hard for folks to give up their beloved gluten, especially when they are “addicted” to it (their truly is an opioid effect involved) and they love that taste. So making new foods that taste the same as the gluten-full foods or finding mainstream foods that are gf and already acceptable to them is very important. There are lots of recipes and ideas on gfe for making that transition. Crustless and flourless pies, cakes, and cookies that people rave over. 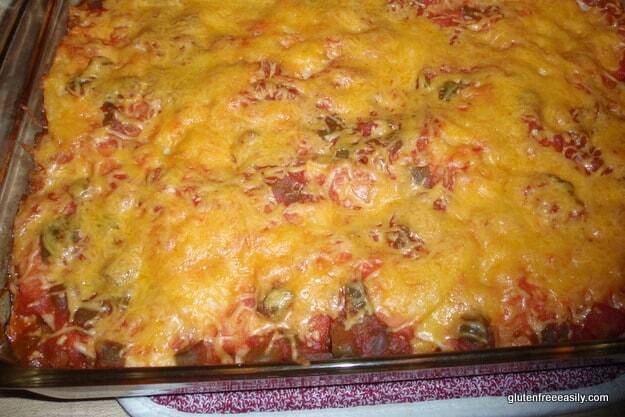 Dishes like this enchilada casserole that taste wonderful. Just look at the recipe page and find some recipes to try. When your family tastes them, they will be surprised at how good they taste—no “weirdness” at all. With time, their view of gluten free can change and perhaps they will eat more gf and start getting better slightly. All that may have an impact and eventually end with the desired outcome. I’ll be thinking of you. Thanks so much for the kind words on my site. Be sure to take a look around and even read other discussion posts like Stop the Madness. Every little bit will help you see how to change, which can possibly lead them to change. Dear Shirley, I’ve just come back to this page and found your response. Thank you so much. I value your thoughts about this situation because I know that you really understand it from all sides. It is encouraging to hear about your son’s journey towards pursuing his own health. I agree that the best I can do is let my pleasure and vitality with gluten free life be an example to those I love. Thanks for all you do on this blog–it is about so much more than food! Thank you so much for this recipe! This was one of the best GF recipes I’ve ever tried. It was great for Cinco de Mayo along with some Spanish rice, and Mexican cornbread. My husband even enjoyed it, and he’s not a big fan of Mexican food. Can’t wait to try the flourless pizza. Thanks again! Hi Shirley, I’m back looking for another recipe. I’ve been a little wary of eating almost anything since I was definitely glutened on Monday. I’m still feeling the effects 2 days later. I’ve never had an official diagnosis, but I’ve been through all of the symptoms and for the last 18 years I’ve been sick. It started with my gallbladder removal, then an RA diagnosis in ’99. Lactose intolerance diagnosed by my daughter a year ago..we did the test. Then just this March she looked at me after I was sick again and in pain and said,”Do you think you might be gluten intolerant?” We got onto the computer and sure enough I fit the profile, or symptoms. Now my dilemma has been trying to find out where the gluten has come from. My husband has finally accepted that gluten is my problem , because I feel so much better when I’m GF. No hip pain, arm or leg pain and my stomach is normal. I’m looking for some GF cool recipes since it’s so darn hot here. I live in New Orleans and we’ve been having record heat, so I don’t want to heat up my kitchen…any suggestions would be great. Hi Lee–It’s good to see you again! 🙂 Sorry for the delayed reply … I’m on vacation right now. I’m terribly sorry you were glutened. That is just the worst. It definitely reinforces the need for being gluten free, but I know it’s a miserable experience. My sympathies. Do what you can to detox quickly, like steamy, hot showers; an epsom salt bath; and walking if you’re up to it (any aerobic exercise helps you get rid of toxins). Probiotics and enzymes (like Glutenzyme) can help, too. Thanks for sharing more of your story and your recovery after going gluten free. I know that it will help others. I’m so glad you husband is supportive. It definitely makes a difference when our loved ones can see us with and without gluten. Nobody wants their family members to suffer. Please don’t forget that these same symptoms also apply to those of us that have NCGS. I have experienced several of these myself and I have NCGS, not Celiac. Hi Robyn–I read your comment while I was on vacation with my husband and then forgot to reply to it once I was back home. 🙁 First, welcome to gfe. 🙂 Second, although I had celiac in the title and in the text, I also mention NCGS and “gluten issues” in the post, because NCGS can be such a cumbersome term. As one who is not diagnosed celiac myself, I am passionate about showing that the same symptoms and associated conditions can happen to anyone affected by either “gluten-related disorder” (a fairly recent term in this area). Many of the practitioners in the gluten-free community have shown that lots of non-celiac individuals experience such “atypical” symptoms, many without any intestinal issues of any kind. Thanks so much for your comment and for sharing a bit of your story with us. This is a great recipe! I followed it exactly and then added a layer of frozen corn and canned black beans over the chicken layer. It has been a hit the two times I have served this. I’ve saved in my bookmarks and now I’m going to pin it so I never lose it. Thanks for a deliscious recipe!